Background: The phenomenon of natural and spontaneous cessation of menstruation in women is termed as menopause. The phase after menopause is called post menopause. Women encounter enormous changes in various physiological factors during and after menopause. Objective: Objectives of this article are to brief the various issues associated with health ailments in postmenopausal Indian women, to address the various factors unique to Indian women involved in the postmenopausal health issues, to discuss the differences in socioeconomic, nutritional and health status between Indian women from rural regions and those from urban regions and to discuss possible precautionary measures against the postmenopausal health issues. 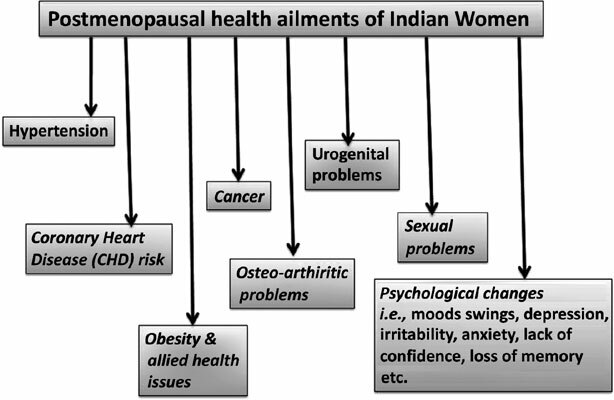 Prime methodology followed in composing the present review article is based on understanding the present scenario regarding the health status of postmenopausal Indian women by considering the various literature and statistics available on the topic. Results: The changes those occur in a woman’s body following menopause are deteriorative, and lead to several health issues. Though some of the health issues including amenorrhea, night sweats, frequent mood swings, cramp pains etc. which a woman experiences during the onset of menopause gradually decrease as her postmenopausal days progress, yet some new detrimental gradual changes occur in her physiological system during the postmenopausal periods. Conclusion: Proper diet, improved lifestyle, self-care, slightest basic precautions and medical aids can help to minimise the ailments which worsen the life of a postmenopausal woman. Awareness and care for postmenopausal Indian women are extremely necessary for providing better life, improved health status and enhanced longevity to them (the mothers) leading to a healthy and developing society. Menopause, Indian women, post-menopause, health, nutrition.